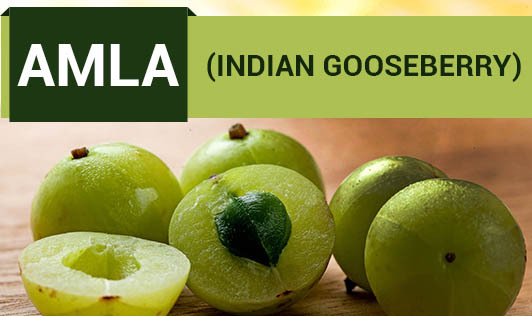 Amla is the fruit of a small, deciduous tree grown all over India. The fruit is round in shape, pale green and translucent with a fine, glossy skin and crunchy, crispy flesh. The aroma is sour and it tastes acidic and leaves the teeth tingling if bitten into. Amla can be used fresh or dried. Dried amla is sometimes ground. Amla is prized both for its high vitamin C content and for the precious oil extracted from its seeds and pulp (used in treatment for hair and scalp problems). Vitamin C in amla helps in fighting free radicals that are responsible for ageing and cell degeneration. Improves immunity and rejuvenates the body. A study has shown that it acts as a cholesterol-lowering agent. It contains chromium 2.5, zinc 4 and copper 3 ppm so it has a therapeutic value in diabetics. As per Ayurveda, it helps to prevent indigestion and control acidity. It acts as a natural coolant and contains anti inflammatory properties. Consuming amla juice or applying amla on grey hair is a remedy for premature graying of hair. Fact: Nothing can stop hair from turning grey and it can't be reversed. Amla is a rich source of vitamin C, so it helps maintain healthy hair. Add grated amla to vegetables, coriander/mint chutneys, salads, cucumber raita or curd. Drink fresh amla juice with a dash of honey to give your day an energetic start. Use as an alternative to tamarind, lemon or such other fruits to add flavor to food. Used amla as dry powder, fresh juice or for a dressing, by grating it coarse, or fine. Amla preserved for a long time in sugar syrup (Amla Murabba) or as a pickle can be used regularly.